I'm always eager to hear and see Au Yong perform his music, which elegantly mingles traditional instruments and theatrical staging with an astute sense of the avant. 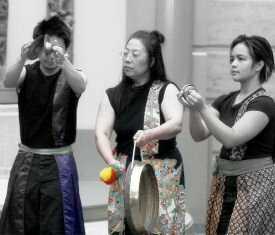 For the site-specific ritual Piao Zhu: Flying Bamboo, Au Yong and his ensemble "play, beat, spin, scratch, sing, dance, roam, and chant with their voices and instruments that include bamboo, Chinese drums, cymbals, flute, harmonica, kubing (mouth harp), and water. Seattle Weekly Pick PIAO ZHU: in English, "flying bamboo," the name for a new dance/percussion/chant meditation/ritual by Byron Au Yong, a composer whose multimedia works are as exquisite and imaginative as they are unclassifiable. International Examiner Highlight: Byron Au Yong brings forth another new performance piece entitled “Flying Bamboo - Piao Zhu” for the Seattle Asian Art Museum on May 6 at 11 a.m. 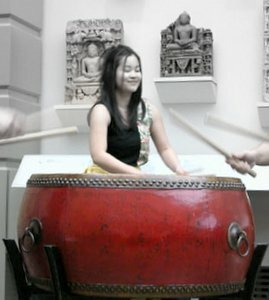 Inspired by the Seven Sages of the Bamboo Grove – a group of scholars and poets who got together to escape politics and societal duress in days of old – this performance is the composer’s own 21st century meditation that reflects on the horror and beauty of bending amidst turmoil like bamboo in a storm. Costumes by Michelle Kumata. Performers include Au Yong, Karen Akada, Kelsey Furuta and Karen Lindenberg. 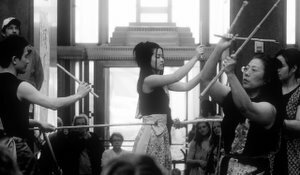 Seattle composer Byron Au Yong unveiled “PIAO ZHU: Flying Bamboo,” a performance that combines dancing, percussion and chanting, at the Seattle Asian Art Museum on May 6. I perform Huo Quan (火圈): Ring of Fire for the Island Music Guild's Pacific Rim Concert. Here are some program notes. 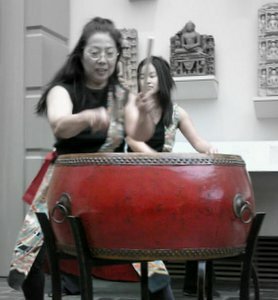 Nature informs and inspires Hou Quan, a solo study for drum and voice. I think about earthquakes and eruptions around the Pacific Ring of Fire and global exchange along the political region known as the Pacific Rim. The boundaries of different geological and cultural elements collide to simultaneously destroy and create.